You did a great job mixing your papers. I like how you created a scene with your green, flowered and blue papers. And I really like those butterflies stamped on vellum. Awesome job on the challenge! I love those butterflies!! Nice dimension with the popped up wings! This is super cute! I am having a hard time with this challenge! You might think you're not good at mixing patterned paper, but this card is beautiful and you did a great job. Very pretty. Oh my goodness that is adorable! You should do my cards for the challenges. lol! LOVE it!! Really, fabulous job!!! You're not good at mixing patterned papers??? This is amazing. It just flows upward from the grass to the flowers to the sky. WOW! Look at those precious butterflies against that blue sky. This is perfect. The ribbon is a nice touch. I have never seen colored vellum before, but you can bet I will be looking for it. I love your card, and wish I had come up something this good! It's beautiful! Gale, this is so, so pretty!! I love your use of patterned paper here! These butterflies are just adorable and I love the trails you've created for them. The whole card comes together so beautifully! Wow You did a great job mixing patterned paper! Your card is gorgeous! Great job on the challenge! What a pretty card! I love those butterflies! WOW! Great job on the challenge! 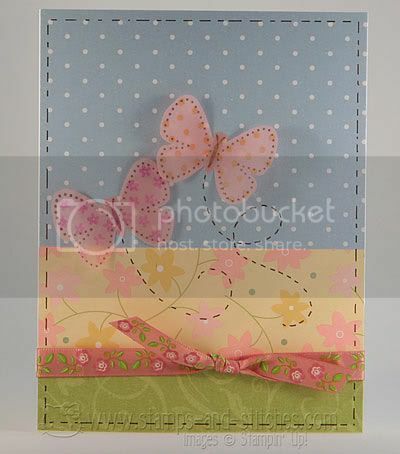 I love how you layered the paper and created that background for your butterflies. Love the patterns on the butterflies. They are so cute. I commented on your beautiful card already! I just wanted you to know I tagged you on my blog! I LOVE these colors Gale - what a beautiful spring card - I love the butterfly! The colors and ribbon and little butterfly stitches are soo sweet!! Sending you happy wishes for a wonderful monday and happy week! This is fantastic!!!! LOVE LOVE LOVE it! Pattern paper is my nightmare. I am so afraid to use it and especially more than one pattern at a time. I love this card and am in awe of your talent. Love you blog, I'm subscribing. Lovely card! I love the combinatin of the different papers! Wow!! Awesome card. I love the butterflies and the ribbon. This is a fantastic mix of papers - great card! How gorgeous! I just love the colors you mixed together. I would say you are a pro at mixing patterned papers.